Clean Motion, the manufacturer of the electric pod Zbee, is presenting a biocomposite enhanced pod where the roof-rear body part has been made out of Jute in a research project. Juteborg AB, a jute Design System & Solution provider was the initiator, with the aim to replace glass fiber with the natural fiber of jute. Co-partners in the project are SwereaSICOMP and Ljungby Komposit and the project is partly financed by Vinnova/Lighter. The research result is shown and presented on Thursday the 31st of January at Lindholmen Science Park in Gothenburg. 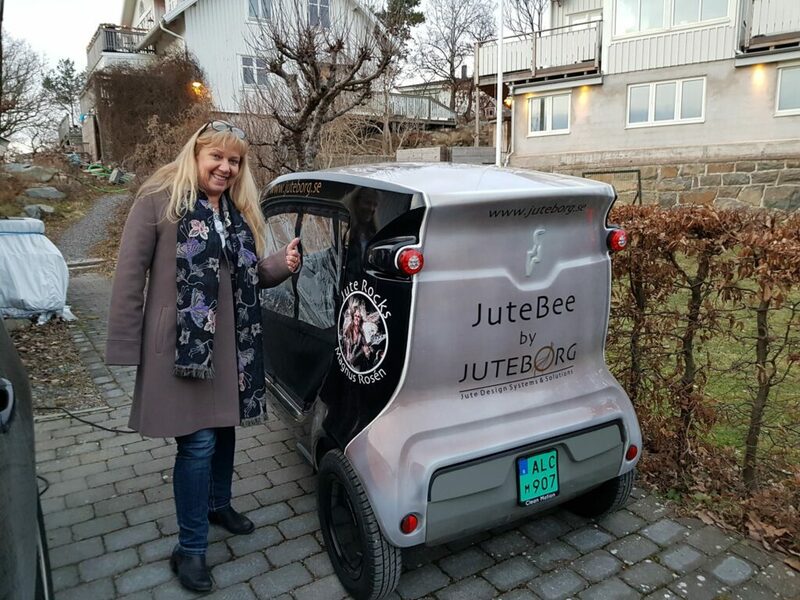 Clean Motion and Juteborg AB is presenting a Zbee with jute fibers in one of the body parts. The roof rear part of one Zbee has been produced with jute fibers instead of glass fibers. It is the result of a research project co-founded by VINNOVA under the Lighter umbrella. A demonstration vehicle has been built, “The JuteBee”, to enable the evaluation of the body structure in real life conditions. With the result of this project Zbee could have the potential to increase its sustainability throughout the lifecycle if the use of biocomposite is implemented. Clean Motion will look into further development on jute, however factors as scaling and raw material refinement will have to be done in order to fully evaluate the material. Juteborg AB, a ‘Jute Design System & Solution Provider’, took the initiative to the lightweight project called JuteTop, with the aim to showcase the potential of jute in automotive applications. Juteborg AB considered jute as the most sustainable material in the world and with their system thinking and sustainability approach, they directly or indirectly are supporting all 17 UN:s Sustainability Development Goals. For most people around Europe, jute is quite unknown, and if known, just for low-tech products like ropes, sacks, and bags. 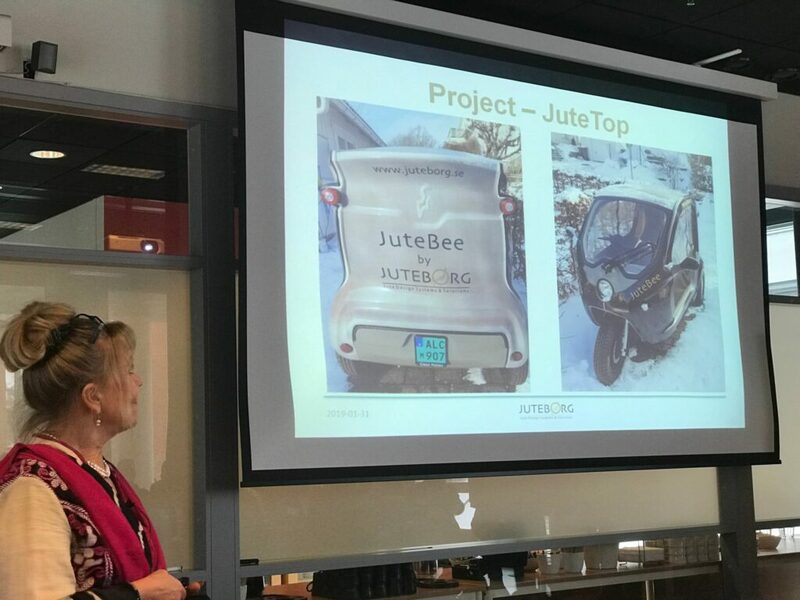 “Jute is such a versatile material, why is it rarely used within the automotive industry?” says Else-Marie Malmek at Juteborg AB, Project Manager for the project. 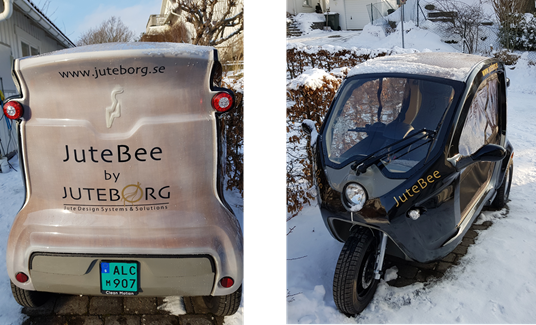 One part of the project is to evaluate the result in the demonstration vehicle, JuteBee, where Clean Motion and Juteborg AB will invite professionals and media into discussions and test drives at the eCon, on the top of Nordstan in Gothenburg. Jesper Martaeng, adds,”We could easily test a lot of materials with the fraction of the cost that would be required for conventional vehicles. This is yet another example on the agility within our product development and production processes”. Else-Marie Malmek, responds, “We know that Juteborg AB can bring agility and entrepreneurial spirit also to the traditional automotive companies, if they dare. We want to challenge them by jute!”. 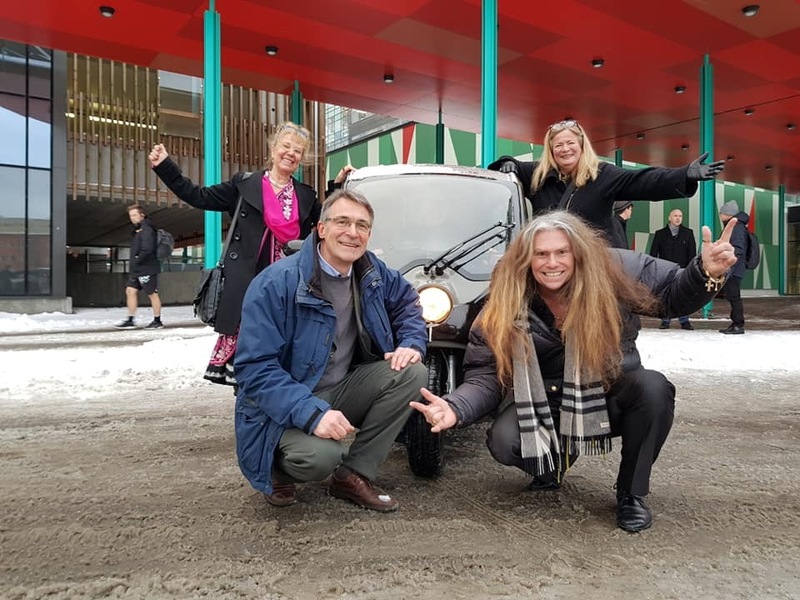 On the 31st of January Clean Motion and Juteborg AB presented the JuteTop project at the Lighter Seminar “Lättvikt inom framtidens vägtransporter”, Lindholmen Science Park. 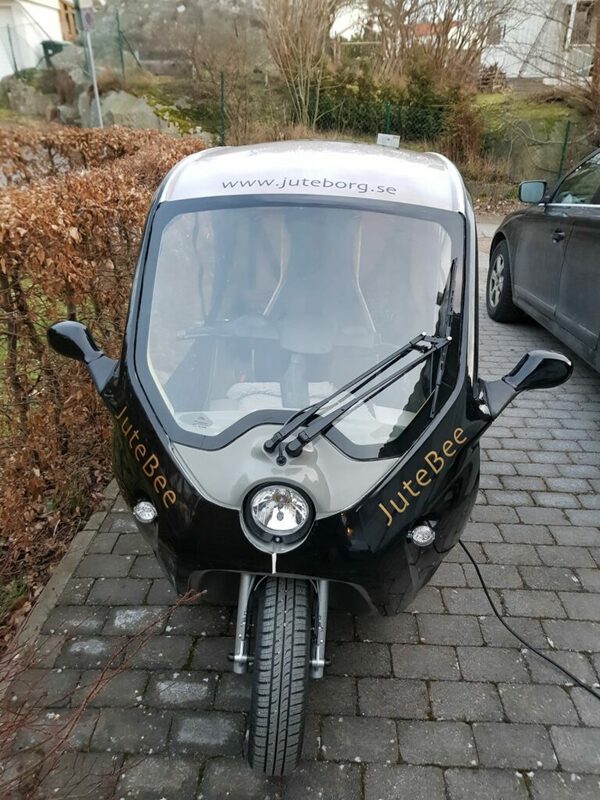 During the seminar it was possible to have a look at JuteBee and test it out. 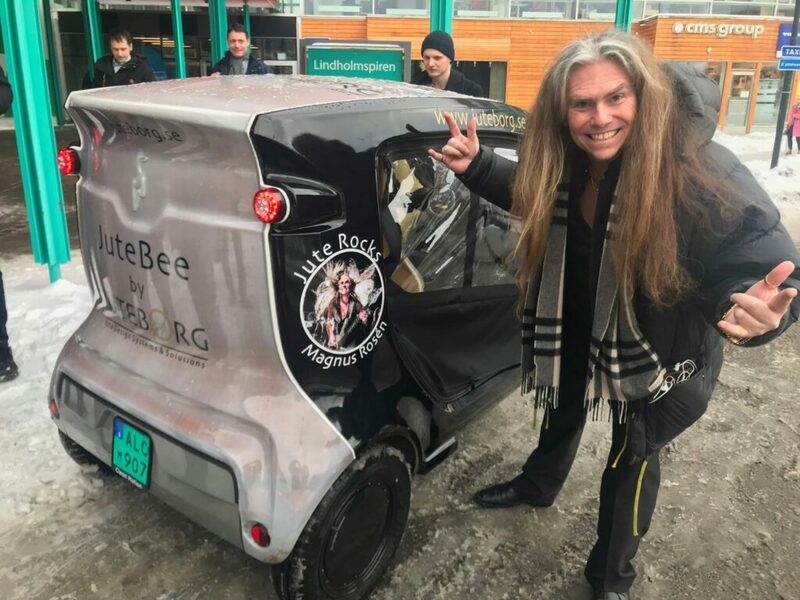 Magnus Rosén, former Bass player in Hammerfall and ‘The Jute Ambassador for Juteborg AB’, played during the seminar. Clean Motion AB is a Swedish company that manufactures and sells electric vehicles. The company vision is to develop truly sustainable products that are affordable for the world’s population. To achieve this Clean Motion have developed the next generation sustainable and efficient pod to meet the demand for future transport needs. The vehicle, Zbee, is a lightweight electric pod with high efficiency, which results in a good total cost of ownership. Clean Motion provides the transportation market with a safe and efficient vehicle for sustainable urban transportation. Clean Motion AB is listed on First North vid Nasdaq Stockholm. Certified Adviser is G&W Fondkommission, e-mail: ca@gwkapital.se, phone: 08-503 000 50. Juteborg AB is an innovative, entrepreneurial and development partner of Jute fiber high tech based products and innovative design services. The company was founded in 2013 by Else-Marie Malmek and Christina Östergren. – With the aim of transforming their respective branches; automotive and construction to a more sustainable future. Juteborg AB has a great network and partnership both in Sweden as well as in Bangladesh. “Jute plants grows 3-4 m high in food crop rotation during monsoon (most realistic crop to grow) in 120 days mostly in Bangladesh without compromising food production. There are three major elements in jute – fiber (2nd highest natural fiber in volume after cotton), sticks (waste material) and leaves all have economic value. Jute is 100% natural, biodegradable and recyclable. The ecological and economical effect when growing jute in crop rotation is that farmers don´t need fertilizers or pesticides for the land which reduces 30% cost in their next crop. The production of 1MT of dry jute fiber (roughly equivalent to 1 MT of dry jute yarn) can fixate 2.556 MT CO2eq during the lifetime of jute cultivation that makes it CO2 negative. 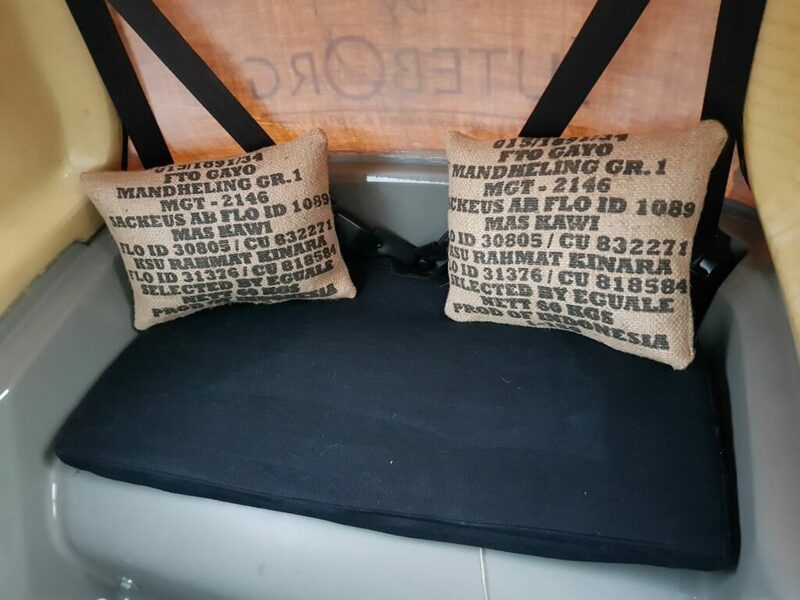 Jute’s tensile strength is stronger than steel, it is light weight, has low density,(jute 1.3 g/cc compared to glass fibre 2.55 g/cc), insulating properties etc. Jute strongly relates to the social sustainability. 1/3 of the 163 million population in Bangladesh depends on the Jute industry; in growing, harvesting and producing low-value jute products (Ref. Jute Ministry Bangladesh).”- Juteborg AB. Juteborg AB considers jute as the most sustainable material in the world! Woah! I’m really loving the template/theme of this website. It’s simple, yet effective. A lot of times it’s hard to get that “perfect balance” between user friendliness and appearance. I must say you have done a awesome job with this. Additionally, the blog loads very fast for me on Opera. Exceptional Blog! I just want to tell you that I’m newbie to blogging and site-building and honestly enjoyed your website. Almost certainly I’m want to bookmark your blog post . You surely come with tremendous articles. Appreciate it for revealing your blog. When I originally commented I clicked the -Notify me when new comments are added- checkbox and today each time a comment is added I am four emails with the same comment. Will there be however you can get rid of me from that service? Thanks! MAY I just say just what a comfort to find somebody who actually is aware of what theyre discussing on the internet. You certainly learn how to bring a concern to light and make it important. More folks need to learn this and understand why side of the storyplot. I cant believe that youre no more popular because you certainly have the surprise. Generally I don’t read article on blogs, but I would like to say that this write-up very compelled me to try and do it! Your writing style has been amazed me. Thank you, quite nice post. I have been browsing online more than three hours these days, yet I never discovered any attention-grabbing article like yours. It¡¦s lovely value sufficient for me. In my view, if all webmasters and bloggers made just right content as you probably did, the net can be much more useful than ever before. Very good written article. It will be useful to anybody who utilizes it, as well as me. Keep doing what you are doing – can’r wait to read more posts. Thank you for any other great post. Where else may anybody get that type of info in such an ideal approach of writing? I’ve a presentation subsequent week, and I’m at the search for such info. I precisely wanted to appreciate you once again. I’m not certain what I would have tried without the actual smart ideas discussed by you concerning my problem. This has been a real traumatic dilemma in my opinion, nevertheless taking a look at the very expert mode you resolved it forced me to leap with gladness. Extremely happy for this service and in addition wish you comprehend what a great job your are carrying out educating the mediocre ones through the use of your web site. I am sure you have never come across all of us. magnificent points altogether, you just received a new reader. What could you suggest in regards to your post that you just made some days ago? Any positive? I will immediately grab your rss feed as I can’t find your e-mail subscription link or e-newsletter service. Do you have any? Kindly permit me know in order that I could subscribe. Thanks. you’re in reality a good webmaster. The site loading speed is incredible. It sort of feels that you are doing any distinctive trick. Furthermore, The contents are masterpiece. you’ve done a fantastic job on this subject! It is the best time to make some plans for the future and it is time to be happy. I’ve read this post and if I could I want to suggest you some interesting things or suggestions. Perhaps you could write next articles referring to this article. I desire to read even more things about it! Excellent post. I was checking constantly this blog and I am impressed! Very helpful info specifically the last part 🙂 I care for such info a lot. I was seeking this certain information for a very long time. Thank you and best of luck. Just want to say your article is as astounding. The clearness in your post is simply cool and i could assume you are an expert on this subject. Fine with your permission let me to grab your RSS feed to keep up to date with forthcoming post. Thanks a million and please keep up the enjoyable work. Great goods from you, man. I’ve understand your stuff previous to and you’re just extremely excellent. I really like what you have acquired here, certainly like what you are stating and the way in which you say it. You make it enjoyable and you still care for to keep it smart. I cant wait to read much more from you. This is actually a tremendous site. Thanks for every other wonderful post. Where else could anybody get that type of information in such a perfect manner of writing? I’ve a presentation subsequent week, and I’m at the search for such info. Thank you, I have just been searching for information about this topic for a while and yours is the best I’ve came upon till now. But, what about the conclusion? Are you sure about the supply? Just desire to say your article is as astounding. The clearness in your post is simply spectacular and i can assume you’re an expert on this subject. Fine with your permission let me to grab your feed to keep updated with forthcoming post. Thanks a million and please continue the enjoyable work. I precisely needed to thank you very much yet again. I do not know the things that I would’ve undertaken in the absence of the type of thoughts documented by you concerning such a area. It was a very challenging situation in my position, but being able to see the well-written technique you dealt with the issue made me to cry for contentment. Now i’m happier for your service and in addition wish you realize what an amazing job that you’re providing teaching some other people through your web site. I am certain you’ve never come across any of us. I would like to thank you for the efforts you have put in writing this site. I’m hoping the same high-grade blog post from you in the upcoming as well. In fact your creative writing abilities has encouraged me to get my own website now. Actually the blogging is spreading its wings quickly. Your write up is a good example of it. Hi there, I found your blog by the use of Google even as looking for a comparable topic, your website got here up, it appears to be like good. I have bookmarked it in my google bookmarks. you are in point of fact a good webmaster. The web site loading velocity is incredible. It seems that you are doing any unique trick. Also, The contents are masterwork. you have done a fantastic activity on this matter! I just want to mention I am just all new to blogs and absolutely enjoyed you’re blog. Almost certainly I’m want to bookmark your site . You really come with wonderful well written articles. Thanks for sharing your blog site. Thank you for any other informative site. Where else may I am getting that type of info written in such an ideal manner? I have a undertaking that I am just now running on, and I’ve been on the look out for such information. I have been exploring for a little bit for any high quality articles or blog posts on this kind of area . Exploring in Yahoo I finally stumbled upon this site. Studying this information So i am satisfied to convey that I’ve an incredibly excellent uncanny feeling I discovered exactly what I needed. I such a lot no doubt will make sure to do not forget this web site and give it a glance on a continuing basis. Hi there very cool blog!! Guy .. Beautiful .. Amazing .. I will bookmark your website and take the feeds additionally¡KI am happy to seek out numerous useful info here in the submit, we need work out extra strategies in this regard, thank you for sharing. . . . . . Thank you so much for providing individuals with an extremely splendid opportunity to read in detail from this blog. It can be very excellent and as well , full of fun for me and my office acquaintances to search your blog at least thrice weekly to see the new stuff you will have. And indeed, I’m certainly astounded with the astonishing suggestions served by you. Selected 3 facts on this page are basically the most impressive I’ve had. Thank you a bunch for sharing this with all people you actually know what you’re talking approximately! Bookmarked. Kindly also consult with my website =). We could have a link trade contract between us! you are really a good webmaster. The site loading speed is amazing. It kind of feels that you’re doing any distinctive trick. Moreover, The contents are masterwork. you’ve performed a wonderful process in this matter! Thank you for another informative site. The place else may I get that kind of info written in such a perfect manner? I’ve a challenge that I am simply now working on, and I’ve been on the glance out for such info. Hiya, I’m really glad I’ve found this information. Nowadays bloggers publish only about gossips and web and this is actually frustrating. A good web site with exciting content, that’s what I need. Thank you for keeping this site, I’ll be visiting it. Do you do newsletters? Can’t find it. Hi there very cool web site!! Guy .. Excellent .. Superb .. I’ll bookmark your blog and take the feeds also¡KI am satisfied to find a lot of helpful information right here within the publish, we need develop more strategies in this regard, thanks for sharing. . . . . . Wonderful goods from you, man. I have understand your stuff previous to and you are just extremely fantastic. I actually like what you have acquired here, really like what you’re stating and the way in which you say it. You make it entertaining and you still care for to keep it smart. I cant wait to read much more from you. This is really a terrific web site. hi!,I love your writing very much! proportion we keep up a correspondence more approximately your article on AOL? I need a specialist on this space to resolve my problem. Maybe that’s you! Looking forward to peer you. I needed to send you the very little remark to help say thanks once again relating to the breathtaking basics you’ve shared on this page. This is so tremendously generous of you in giving publicly all many individuals could have offered for sale as an e-book to help with making some money for their own end, especially considering the fact that you might have tried it in case you wanted. The secrets as well worked to become good way to know that other people have the identical passion just like my own to realize significantly more related to this problem. I am certain there are lots of more pleasurable periods up front for people who scan through your blog post. I as well as my guys ended up studying the great techniques found on your web blog and then quickly developed a horrible feeling I had not expressed respect to you for those tips. Most of the men ended up for that reason thrilled to read them and already have absolutely been using these things. Many thanks for turning out to be indeed helpful as well as for picking out some wonderful guides millions of individuals are really desirous to be informed on. Our own honest apologies for not expressing appreciation to earlier. Thanks a bunch for sharing this with all people you actually know what you are talking about! Bookmarked. Kindly additionally consult with my website =). We can have a link alternate arrangement between us! I needed to post you this little word to be able to give many thanks yet again over the nice advice you’ve featured in this article. It’s really surprisingly open-handed of you to provide freely all that many of us could possibly have made available for an ebook to make some bucks on their own, especially considering that you could have done it if you wanted. These good tips additionally served to be a great way to comprehend other people have a similar passion the same as my very own to figure out many more on the subject of this problem. I think there are numerous more pleasant opportunities up front for people who read carefully your site. Great tremendous things here. I am very satisfied to look your article. Thank you a lot and i’m looking ahead to touch you. Will you kindly drop me a e-mail? hey there and thank you for your information – I’ve certainly picked up anything new from right here. I did however expertise some technical points using this website, as I experienced to reload the web site lots of times previous to I could get it to load correctly. I had been wondering if your hosting is OK? Not that I’m complaining, but slow loading instances times will often affect your placement in google and could damage your high-quality score if advertising and marketing with Adwords. Anyway I am adding this RSS to my e-mail and could look out for a lot more of your respective interesting content. Make sure you update this again soon.. I have been examinating out some of your articles and i must say pretty clever stuff. I will make sure to bookmark your blog. I have been exploring for a little bit for any high-quality articles or blog posts on this sort of space . Exploring in Yahoo I eventually stumbled upon this website. Reading this info So i am happy to exhibit that I have a very excellent uncanny feeling I came upon just what I needed. I most undoubtedly will make sure to don¡¦t omit this website and provides it a look regularly. Whats Happening i’m new to this, I stumbled upon this I’ve discovered It positively useful and it has aided me out loads. I am hoping to contribute & assist other customers like its aided me. Great job. Excellent goods from you, man. I have understand your stuff previous to and you are just extremely wonderful. I actually like what you have acquired here, really like what you’re stating and the way in which you say it. You make it entertaining and you still take care of to keep it smart. I can’t wait to read far more from you. This is actually a great website. Hey there. I found your site by the use of Google at the same time as looking for a related topic, your site got here up. It appears to be good. I have bookmarked it in my google bookmarks to come back then. whoah this weblog is excellent i like studying your articles. Stay up the great paintings! You understand, lots of people are searching round for this information, you can help them greatly. I carry on listening to the news update lecture about getting boundless online grant applications so I have been looking around for the most excellent site to get one. Could you tell me please, where could i find some? Hello, Neat post. There’s an issue together with your website in internet explorer, might check this¡K IE nonetheless is the market leader and a good component to people will leave out your wonderful writing due to this problem. Hiya, I am really glad I’ve found this information. Nowadays bloggers publish only about gossip and internet stuff and this is actually annoying. A good website with exciting content, that is what I need. Thank you for making this web site, and I will be visiting again. Do you do newsletters by email? I as well as my pals happened to be reading through the good helpful hints from your web site and before long got a horrible feeling I had not expressed respect to the web site owner for those secrets. These people had been for this reason very interested to learn all of them and have in effect surely been loving those things. Thank you for indeed being considerably kind and then for choosing this kind of quality areas most people are really desperate to understand about. Our own honest apologies for not expressing gratitude to you sooner. I¡¦m not certain where you are getting your information, but great topic. I needs to spend a while studying much more or understanding more. Thank you for excellent info I used to be in search of this info for my mission. Hiya, I’m really glad I have found this info. Nowadays bloggers publish just about gossip and web stuff and this is actually irritating. A good blog with interesting content, this is what I need. Thanks for making this site, and I will be visiting again. Do you do newsletters by email? I have to point out my admiration for your kind-heartedness giving support to visitors who require assistance with this one concept. Your very own commitment to passing the message around became surprisingly practical and have surely enabled others just like me to get to their endeavors. Your important guideline denotes a lot a person like me and even more to my colleagues. Thanks a ton; from each one of us. A person necessarily help to make significantly posts I would state. This is the first time I frequented your web page and up to now? I amazed with the analysis you made to create this particular publish incredible. Fantastic process! I’m still learning from you, while I’m making my way to the top as well. I absolutely liked reading everything that is written on your website.Keep the aarticles coming. I enjoyed it! Whats Taking place i’m new to this, I stumbled upon this I have discovered It absolutely useful and it has aided me out loads. I am hoping to contribute & help other customers like its aided me. Great job. Hiya, I’m really glad I’ve found this information. Today bloggers publish just about gossip and internet stuff and this is actually frustrating. A good blog with interesting content, that is what I need. Thank you for making this site, and I’ll be visiting again. Do you do newsletters by email? Hiya, I’m really glad I have found this information. Today bloggers publish just about gossip and net stuff and this is really frustrating. A good site with exciting content, that’s what I need. Thanks for making this website, and I will be visiting again. Do you do newsletters by email? Hiya, I am really glad I have found this info. Nowadays bloggers publish only about gossip and web stuff and this is actually irritating. A good web site with interesting content, this is what I need. Thank you for making this site, and I’ll be visiting again. Do you do newsletters by email? Hiya, I’m really glad I’ve found this information. Today bloggers publish just about gossip and web stuff and this is really annoying. A good website with interesting content, this is what I need. Thank you for making this web-site, and I will be visiting again. Do you do newsletters by email? hello there and thank you for your information – I’ve definitely picked up anything new from right here. I did however expertise several technical points using this website, as I experienced to reload the website a lot of times previous to I could get it to load properly. I had been wondering if your web hosting is OK? Not that I am complaining, but slow loading instances times will sometimes affect your placement in google and can damage your quality score if ads and marketing with Adwords. Anyway I am adding this RSS to my e-mail and could look out for a lot more of your respective fascinating content. Make sure you update this again soon.. I enjoy you because of all of your work on this web page. My mom delights in making time for internet research and it’s easy to see why. We know all of the dynamic means you render invaluable techniques on your blog and in addition increase response from others on the issue while our favorite child is without question being taught a lot. Take pleasure in the remaining portion of the year. You are carrying out a tremendous job. Hey there. I discovered your website by means of Google while looking for a related topic, your website got here up. It seems to be great. I have bookmarked it in my google bookmarks to come back then. Hello there. I discovered your website by the use of Google even as looking for a similar topic, your web site came up. It appears good. I have bookmarked it in my google bookmarks to come back then. I¡¦m no longer positive where you are getting your information, however good topic. I must spend a while finding out more or figuring out more. Thank you for magnificent info I was looking for this information for my mission. Wow, superb weblog format! How lengthy have you ever been blogging for? you made blogging glance easy. The entire glance of your web site is great, as well as the content material! Hello there. I discovered your web site by the use of Google while looking for a comparable topic, your site came up. It looks good. I’ve bookmarked it in my google bookmarks to visit then. Hey there. I found your website by the use of Google while searching for a comparable subject, your website got here up. It looks great. I have bookmarked it in my google bookmarks to visit then. Hello there. I found your website by way of Google even as searching for a similar matter, your web site got here up. It appears to be great. I have bookmarked it in my google bookmarks to visit then. Nice post. I was checking continuously this blog and I’m impressed! Very helpful information specifically the last part 🙂 I care for such information a lot. I was seeking this certain info for a long time. Thank you and best of luck. Hello there. I discovered your web site by means of Google while looking for a comparable topic, your site came up. It appears great. I’ve bookmarked it in my google bookmarks to visit then. I have learn a few good stuff here. Definitely worth bookmarking for revisiting. I wonder how much attempt you put to create one of these wonderful informative website. Hello there, I discovered your website by the use of Google even as searching for a related topic, your website came up, it seems good. I’ve bookmarked it in my google bookmarks. magnificent points altogether, you simply received a logo new reader. What may you recommend in regards to your put up that you made a few days ago? Any certain? I simply needed to thank you so much once again. I’m not certain the things that I might have followed in the absence of the actual ways documented by you about this problem. It absolutely was a very horrifying difficulty in my opinion, nevertheless taking a look at the professional avenue you dealt with it took me to weep over fulfillment. I am grateful for the service and as well , believe you comprehend what an amazing job you’re carrying out training the mediocre ones with the aid of your site. More than likely you have never met any of us. Hey there. I discovered your web site via Google whilst looking for a similar subject, your web site got here up. It looks good. I’ve bookmarked it in my google bookmarks to come back then. you’re actually a excellent webmaster. The web site loading speed is amazing. It sort of feels that you’re doing any distinctive trick. Furthermore, The contents are masterpiece. you have performed a great task on this matter! of course like your web-site but you have to check the spelling on several of your posts. Several of them are rife with spelling problems and I find it very bothersome to inform the reality then again I will certainly come back again. Hiya, I am really glad I have found this information. Today bloggers publish only about gossip and net stuff and this is really irritating. A good web site with exciting content, this is what I need. Thanks for making this web-site, and I will be visiting again. Do you do newsletters by email? Excellent goods from you, man. I have understand your stuff previous to and you are just too great. I really like what you have acquired here, certainly like what you are stating and the way in which you say it. You make it enjoyable and you still take care of to keep it sensible. I cant wait to read much more from you. This is actually a terrific site. Hiya very cool website!! Man .. Beautiful .. Wonderful .. I’ll bookmark your web site and take the feeds also¡KI am glad to seek out a lot of useful information here within the put up, we need develop extra techniques on this regard, thank you for sharing. . . . . .
Hello, Neat post. There’s an issue with your web site in web explorer, would check this¡K IE nonetheless is the marketplace chief and a large component of folks will omit your wonderful writing due to this problem. I would like to thank you for the efforts you have put in writing this blog. I’m hoping the same high-grade website post from you in the upcoming also. In fact your creative writing skills has inspired me to get my own web site now. Really the blogging is spreading its wings fast. Your write up is a great example of it. I in addition to my friends were found to be checking out the great information and facts found on the blog while then developed a terrible feeling I had not expressed respect to the web site owner for those tips. My ladies came for that reason excited to see all of them and already have really been using these things. Thank you for actually being quite helpful and also for opting for this sort of excellent issues most people are really desirous to understand about. My very own honest regret for not saying thanks to earlier. Hello there. I found your website by the use of Google whilst looking for a comparable subject, your website came up. It seems to be good. I have bookmarked it in my google bookmarks to come back then. Hiya, I’m really glad I have found this information. Today bloggers publish just about gossip and internet stuff and this is really frustrating. A good site with exciting content, this is what I need. Thank you for making this site, and I’ll be visiting again. Do you do newsletters by email? Hiya, I am really glad I have found this info. Nowadays bloggers publish only about gossip and internet stuff and this is actually annoying. A good website with exciting content, this is what I need. Thank you for making this site, and I’ll be visiting again. Do you do newsletters by email? You’re so awesome! I do not believe I’ve read through something like this before. So wonderful to discover another person with a few original thoughts on this subject matter. Really.. thanks for starting this up. This site is something that is required on the internet, someone with a bit of originality! I am just writing to let you understand what a remarkable encounter my friend’s child gained checking the blog. She even learned too many details, which include how it is like to have an incredible coaching spirit to let many others effortlessly know just exactly certain tricky subject areas. You truly surpassed our own desires. Many thanks for rendering these great, trustworthy, explanatory and as well as easy thoughts on the topic to Lizeth. Thank you for sharing superb informations. Your web site is so cool. I’m impressed by the details that you have on this website. It reveals how nicely you perceive this subject. Bookmarked this website page, will come back for extra articles. You, my pal, ROCK! I found simply the info I already searched all over the place and just could not come across. What a great site. Wonderful site. Plenty of useful info here. I am sending it to several friends ans also sharing in delicious. And naturally, thank you for your sweat! Thank you for your own efforts on this web page. My aunt really loves conducting research and it’s obvious why. Many of us know all relating to the dynamic method you offer useful solutions via this website and even attract contribution from other ones on that subject so our favorite girl has been discovering a lot. Take pleasure in the remaining portion of the new year. Your doing a powerful job. You completed a number of nice points there. I did a search on the issue and found mainly people will agree with your blog. Valuable info. Lucky me I discovered your site unintentionally, and I am stunned why this accident didn’t came about in advance! I bookmarked it. My spouse and i felt now joyful Raymond managed to round up his researching because of the precious recommendations he grabbed while using the blog. It is now and again perplexing to simply be releasing solutions a number of people might have been making money from. We really discover we need the website owner to thank because of that. The entire illustrations you’ve made, the simple website navigation, the relationships you can help to foster – it’s mostly spectacular, and it is making our son and our family do think the issue is entertaining, and that’s unbelievably vital. Many thanks for everything! Hi there. I discovered your website by means of Google at the same time as searching for a comparable topic, your web site came up. It appears great. I have bookmarked it in my google bookmarks to come back then. I wanted to make a simple comment in order to appreciate you for all the marvelous recommendations you are posting on this site. My long internet research has finally been compensated with professional tips to talk about with my pals. I would point out that most of us readers are extremely lucky to be in a decent place with so many lovely professionals with great tips and hints. I feel pretty privileged to have encountered the webpage and look forward to so many more fun moments reading here. Thanks a lot once more for a lot of things. Hiya, I’m really glad I’ve found this information. Nowadays bloggers publish just about gossip and net stuff and this is really irritating. A good web site with interesting content, that’s what I need. Thank you for making this website, and I’ll be visiting again. Do you do newsletters by email? you are in reality a excellent webmaster. The website loading speed is amazing. It kind of feels that you are doing any unique trick. In addition, The contents are masterwork. you’ve performed a wonderful process on this matter! Hello there. I found your blog by way of Google whilst searching for a related matter, your site got here up. It looks great. I have bookmarked it in my google bookmarks to visit then. Hey there. I discovered your site by the use of Google while searching for a related matter, your site got here up. It appears to be good. I have bookmarked it in my google bookmarks to visit then. Hiya, I am really glad I have found this info. Nowadays bloggers publish only about gossip and web stuff and this is actually frustrating. A good blog with interesting content, this is what I need. Thanks for making this site, and I’ll be visiting again. Do you do newsletters by email? Hello there. I found your site by way of Google while searching for a similar topic, your website came up. It looks great. I’ve bookmarked it in my google bookmarks to visit then. Hi there. I found your website via Google at the same time as looking for a similar subject, your web site came up. It looks great. I’ve bookmarked it in my google bookmarks to come back then. Hello there. I discovered your web site via Google while searching for a comparable matter, your website got here up. It appears great. I have bookmarked it in my google bookmarks to come back then. Hey there. I found your web site via Google while looking for a comparable subject, your web site came up. It seems to be great. I have bookmarked it in my google bookmarks to come back then. Hi there. I discovered your site via Google at the same time as searching for a similar topic, your site came up. It seems to be good. I’ve bookmarked it in my google bookmarks to come back then. Hey there. I found your website via Google whilst searching for a similar topic, your site came up. It seems great. I’ve bookmarked it in my google bookmarks to visit then. Hiya, I’m really glad I have found this info. Today bloggers publish just about gossip and web stuff and this is actually frustrating. A good site with exciting content, this is what I need. Thank you for making this web-site, and I’ll be visiting again. Do you do newsletters by email? That is a great tip especially to those fresh to the blogosphere. Brief but very accurate information… Thanks for sharing this one. A must read post! I precisely needed to appreciate you once more. I’m not certain what I would have handled without the type of thoughts provided by you on that question. It became a real frightful matter in my position, nevertheless encountering a new specialised tactic you processed that forced me to weep over happiness. I am just happy for your assistance and wish you are aware of a great job you are always putting in teaching the mediocre ones via your websites. Probably you’ve never encountered any of us. I truly wanted to compose a simple note to be able to say thanks to you for all the superb advice you are sharing at this site. My extended internet research has finally been recognized with good quality knowledge to exchange with my good friends. I would assert that many of us readers are undoubtedly lucky to live in a perfect community with many wonderful professionals with beneficial concepts. I feel extremely privileged to have encountered your entire site and look forward to plenty of more pleasurable minutes reading here. Thank you once more for all the details. Hiya, I am really glad I’ve found this information. Today bloggers publish only about gossip and internet stuff and this is really annoying. A good site with interesting content, this is what I need. Thank you for making this website, and I will be visiting again. Do you do newsletters by email? Hey there. I discovered your website by means of Google even as looking for a related matter, your website got here up. It seems great. I have bookmarked it in my google bookmarks to come back then. Hiya, I’m really glad I have found this info. Nowadays bloggers publish only about gossip and net stuff and this is actually irritating. A good blog with exciting content, that’s what I need. Thanks for making this site, and I’ll be visiting again. Do you do newsletters by email? Hello there. I found your blog by means of Google even as searching for a similar matter, your website came up. It seems great. I’ve bookmarked it in my google bookmarks to visit then. Hey there. I discovered your site by means of Google whilst looking for a related matter, your website got here up. It seems good. I’ve bookmarked it in my google bookmarks to come back then. Hi there. I found your web site by the use of Google even as searching for a similar matter, your web site came up. It seems good. I’ve bookmarked it in my google bookmarks to come back then. Hey there. I discovered your web site by means of Google whilst searching for a comparable topic, your site got here up. It appears to be great. I have bookmarked it in my google bookmarks to come back then. I have been surfing online greater than three hours nowadays, but I by no means found any interesting article like yours. It is pretty price enough for me. In my opinion, if all web owners and bloggers made excellent content material as you probably did, the internet might be much more useful than ever before. Wonderful goods from you, man. I have understand your stuff previous to and you are just too excellent. I actually like what you have acquired here, certainly like what you’re stating and the way in which you say it. You make it entertaining and you still care for to keep it wise. I can not wait to read far more from you. This is really a terrific site. Wow, marvelous blog structure! How lengthy have you been running a blog for? you made running a blog look easy. The entire glance of your web site is excellent, as smartly as the content material! Thanks a lot for sharing this with all of us you actually recognize what you are talking about! Bookmarked. Please also talk over with my site =). We will have a link trade contract between us! You actually make it appear so easy along with your presentation but I in finding this matter to be actually one thing which I believe I would never understand. It seems too complicated and extremely wide for me. I’m looking forward for your subsequent publish, I will try to get the grasp of it! I have to express thanks to the writer just for bailing me out of this type of matter. Just after browsing throughout the the net and getting concepts which were not productive, I believed my entire life was over. Being alive without the solutions to the issues you’ve resolved as a result of your good website is a critical case, and ones which might have in a negative way damaged my entire career if I hadn’t noticed your blog post. Your understanding and kindness in handling all the pieces was invaluable. I am not sure what I would’ve done if I hadn’t discovered such a thing like this. I’m able to at this time look ahead to my future. Thank you so much for this specialized and amazing guide. I won’t think twice to endorse your web sites to any person who should get recommendations on this problem. Hiya, I am really glad I have found this info. Nowadays bloggers publish just about gossip and net stuff and this is actually frustrating. A good site with interesting content, this is what I need. Thank you for making this web site, and I will be visiting again. Do you do newsletters by email? Hiya, I am really glad I’ve found this info. Nowadays bloggers publish just about gossip and internet stuff and this is really irritating. A good site with exciting content, this is what I need. Thanks for making this website, and I’ll be visiting again. Do you do newsletters by email? Hello there. I discovered your site by means of Google while looking for a similar topic, your web site came up. It seems great. I have bookmarked it in my google bookmarks to come back then. Hi there. I found your blog by means of Google at the same time as looking for a comparable subject, your web site got here up. It appears great. I have bookmarked it in my google bookmarks to visit then. Hiya, I am really glad I’ve found this information. Nowadays bloggers publish only about gossip and web stuff and this is actually frustrating. A good site with interesting content, that is what I need. Thanks for making this web-site, and I’ll be visiting again. Do you do newsletters by email? Hiya, I am really glad I’ve found this information. Today bloggers publish only about gossip and net stuff and this is actually frustrating. A good site with exciting content, that is what I need. Thank you for making this web site, and I’ll be visiting again. Do you do newsletters by email? Thanks a lot for providing individuals with an exceptionally breathtaking possiblity to discover important secrets from here. It really is so cool and packed with a lot of fun for me personally and my office peers to search the blog at the very least 3 times per week to read through the newest things you have got. And indeed, I’m also at all times happy for the perfect opinions served by you. Certain 1 areas in this article are completely the finest we have all had. Hi there. I discovered your blog via Google even as looking for a similar subject, your website got here up. It looks great. I have bookmarked it in my google bookmarks to come back then. I have read some excellent stuff here. Definitely price bookmarking for revisiting. I wonder how a lot effort you place to make any such magnificent informative site. I was just looking for this info for some time. After 6 hours of continuous Googleing, at last I got it in your website. I wonder what is the lack of Google strategy that do not rank this kind of informative websites in top of the list. Generally the top web sites are full of garbage. Hiya, I am really glad I’ve found this information. Nowadays bloggers publish only about gossip and internet stuff and this is really frustrating. A good website with exciting content, this is what I need. Thanks for making this web-site, and I will be visiting again. Do you do newsletters by email? Hello there. I found your website via Google while searching for a related matter, your site came up. It appears good. I’ve bookmarked it in my google bookmarks to visit then. Hiya, I’m really glad I’ve found this info. Today bloggers publish only about gossip and internet stuff and this is actually annoying. A good web site with exciting content, this is what I need. Thank you for making this site, and I will be visiting again. Do you do newsletters by email? Thank you, I have recently been looking for info approximately this subject for a long time and yours is the greatest I’ve found out till now. But, what about the bottom line? Are you sure about the source? Hiya, I am really glad I’ve found this info. Today bloggers publish just about gossip and net stuff and this is really frustrating. A good site with interesting content, this is what I need. Thanks for making this web-site, and I’ll be visiting again. Do you do newsletters by email? Valuable info. Fortunate me I found your website by chance, and I am stunned why this twist of fate did not came about earlier! I bookmarked it. Hiya, I’m really glad I’ve found this info. Nowadays bloggers publish just about gossip and web stuff and this is actually irritating. A good blog with exciting content, that is what I need. Thank you for making this website, and I’ll be visiting again. Do you do newsletters by email? Hiya, I’m really glad I’ve found this information. Today bloggers publish just about gossip and internet stuff and this is actually annoying. A good web site with exciting content, that’s what I need. Thanks for making this web-site, and I’ll be visiting again. Do you do newsletters by email? Hiya, I am really glad I have found this info. Nowadays bloggers publish only about gossip and net stuff and this is actually annoying. A good blog with exciting content, that is what I need. Thank you for making this site, and I’ll be visiting again. Do you do newsletters by email? Hi there. I found your site by means of Google even as searching for a related subject, your web site got here up. It seems good. I have bookmarked it in my google bookmarks to visit then. Hiya, I’m really glad I’ve found this info. Today bloggers publish only about gossip and web stuff and this is actually frustrating. A good website with interesting content, this is what I need. Thank you for making this website, and I’ll be visiting again. Do you do newsletters by email? Hello there. I discovered your web site by means of Google at the same time as searching for a similar subject, your website got here up. It appears good. I’ve bookmarked it in my google bookmarks to come back then. I simply want to mention I’m newbie to weblog and definitely savored you’re blog site. Most likely I’m likely to bookmark your blog post . You certainly come with fabulous stories. Many thanks for sharing with us your webpage. Thanks for any other wonderful post. The place else could anyone get that kind of info in such an ideal approach of writing? I have a presentation subsequent week, and I’m on the search for such information. Hey there. I found your blog by means of Google at the same time as looking for a comparable subject, your website got here up. It appears to be good. I have bookmarked it in my google bookmarks to visit then. Hey there. I discovered your site by the use of Google whilst searching for a related matter, your website came up. It seems to be great. I have bookmarked it in my google bookmarks to visit then. Hey there. I found your web site via Google at the same time as looking for a similar matter, your site got here up. It seems great. I’ve bookmarked it in my google bookmarks to visit then. Hi there. I found your blog by means of Google at the same time as searching for a comparable topic, your site got here up. It seems good. I have bookmarked it in my google bookmarks to visit then. Hiya, I am really glad I have found this information. Nowadays bloggers publish only about gossip and net stuff and this is actually frustrating. A good web site with exciting content, that’s what I need. Thank you for making this site, and I’ll be visiting again. Do you do newsletters by email? An impressive share! I’ve just forwarded this onto a friend who had been doing a little research on this. And he in fact bought me dinner due to the fact that I stumbled upon it for him… lol. So allow me to reword this…. Thanks for the meal!! But yeah, thanks for spending the time to talk about this subject here on your web site. Hi there. I discovered your web site by the use of Google while searching for a similar matter, your website came up. It seems to be good. I have bookmarked it in my google bookmarks to come back then. whoah this weblog is fantastic i really like reading your articles. Stay up the good paintings! You know, many individuals are hunting round for this information, you can help them greatly. Hi there. I found your blog via Google whilst searching for a related topic, your web site got here up. It seems to be great. I’ve bookmarked it in my google bookmarks to visit then. Hi there. I found your site by way of Google whilst searching for a related matter, your web site got here up. It seems great. I have bookmarked it in my google bookmarks to come back then. Great ¡V I should definitely pronounce, impressed with your site. I had no trouble navigating through all tabs and related information ended up being truly simple to do to access. I recently found what I hoped for before you know it at all. Reasonably unusual. Is likely to appreciate it for those who add forums or anything, website theme . a tones way for your customer to communicate. Nice task..
It¡¦s actually a great and useful piece of information. I am glad that you simply shared this useful info with us. Please keep us up to date like this. Thank you for sharing. You actually make it seem so easy with your presentation but I find this matter to be really one thing which I believe I’d by no means understand. It kind of feels too complex and very wide for me. I’m looking ahead to your subsequent post, I will try to get the hold of it! It¡¦s in point of fact a nice and helpful piece of information. I¡¦m satisfied that you simply shared this helpful info with us. Please stay us informed like this. Thank you for sharing. great put up, very informative. I wonder why the opposite specialists of this sector do not notice this. You should continue your writing. I am sure, you’ve a huge readers’ base already! Hiya, I’m really glad I’ve found this info. Today bloggers publish only about gossip and net stuff and this is really irritating. A good blog with exciting content, that is what I need. Thanks for making this web-site, and I’ll be visiting again. Do you do newsletters by email? Hiya, I’m really glad I’ve found this information. Nowadays bloggers publish just about gossip and web stuff and this is actually frustrating. A good web site with exciting content, that’s what I need. Thanks for making this website, and I will be visiting again. Do you do newsletters by email? Hey there. I discovered your website via Google at the same time as looking for a similar matter, your site came up. It appears good. I have bookmarked it in my google bookmarks to come back then. Hiya, I’m really glad I have found this info. Nowadays bloggers publish only about gossip and net stuff and this is really frustrating. A good site with exciting content, that is what I need. Thank you for making this website, and I’ll be visiting again. Do you do newsletters by email? Hi there. I found your site by way of Google while looking for a related topic, your site got here up. It seems to be good. I have bookmarked it in my google bookmarks to come back then. Hiya, I’m really glad I have found this information. Nowadays bloggers publish only about gossip and net stuff and this is really annoying. A good blog with exciting content, this is what I need. Thank you for making this web site, and I’ll be visiting again. Do you do newsletters by email? Hi there. I found your site via Google whilst looking for a similar subject, your web site came up. It looks good. I’ve bookmarked it in my google bookmarks to visit then. Hey there. I discovered your website via Google while looking for a related subject, your site came up. It appears to be great. I have bookmarked it in my google bookmarks to visit then. Hey there. I found your website via Google while searching for a similar subject, your site came up. It seems to be great. I’ve bookmarked it in my google bookmarks to visit then. Whats Going down i am new to this, I stumbled upon this I have discovered It absolutely helpful and it has helped me out loads. I hope to contribute & help other customers like its aided me. Good job. Hi there. I found your web site via Google at the same time as searching for a similar matter, your website came up. It seems to be good. I’ve bookmarked it in my google bookmarks to come back then. Hiya, I’m really glad I’ve found this info. Today bloggers publish just about gossip and net stuff and this is actually frustrating. A good blog with exciting content, that is what I need. Thanks for making this website, and I’ll be visiting again. Do you do newsletters by email? Hi there. I discovered your web site by the use of Google while looking for a comparable subject, your website got here up. It seems great. I’ve bookmarked it in my google bookmarks to visit then. Hello there. I discovered your website via Google whilst searching for a comparable matter, your site got here up. It seems to be good. I’ve bookmarked it in my google bookmarks to visit then. This piece of writing offers clear idea for the new people of blogging, that actually how to do blogging and site-building. Hiya, I am really glad I have found this information. Nowadays bloggers publish only about gossip and internet stuff and this is really annoying. A good web site with interesting content, that is what I need. Thank you for making this web-site, and I will be visiting again. Do you do newsletters by email? Hello there. I discovered your site by means of Google while looking for a similar subject, your site got here up. It seems to be great. I have bookmarked it in my google bookmarks to come back then. Whats Going down i’m new to this, I stumbled upon this I have found It positively helpful and it has helped me out loads. I hope to contribute & help other customers like its aided me. Good job. Hiya, I’m really glad I’ve found this information. Nowadays bloggers publish just about gossip and net stuff and this is actually irritating. A good web site with interesting content, this is what I need. Thanks for making this web site, and I will be visiting again. Do you do newsletters by email? Hey there. I found your site via Google while looking for a related topic, your site came up. It appears to be great. I have bookmarked it in my google bookmarks to visit then. Hello there. I found your website by way of Google at the same time as looking for a comparable topic, your site came up. It looks good. I have bookmarked it in my google bookmarks to come back then. Hello there. I discovered your website by means of Google while searching for a comparable topic, your web site came up. It seems to be great. I have bookmarked it in my google bookmarks to come back then. Hiya, I’m really glad I’ve found this information. Nowadays bloggers publish just about gossip and internet stuff and this is really annoying. A good site with exciting content, this is what I need. Thanks for making this web site, and I’ll be visiting again. Do you do newsletters by email? I was very happy to uncover this site. I need to to thank you for ones time for this particularly wonderful read!! I definitely liked every part of it and I have you saved as a favorite to see new stuff in your web site. Hello there. I found your web site via Google while looking for a comparable subject, your site got here up. It looks great. I’ve bookmarked it in my google bookmarks to come back then. Hiya, I am really glad I’ve found this information. Today bloggers publish only about gossip and web stuff and this is actually frustrating. A good web site with interesting content, this is what I need. Thanks for making this web site, and I will be visiting again. Do you do newsletters by email? Hey there. I discovered your web site by the use of Google while searching for a related matter, your web site got here up. It appears good. I have bookmarked it in my google bookmarks to come back then. Hi there. I found your blog by way of Google at the same time as searching for a similar topic, your web site came up. It appears good. I have bookmarked it in my google bookmarks to visit then. Hiya, I am really glad I’ve found this information. Nowadays bloggers publish just about gossip and internet stuff and this is actually frustrating. A good blog with interesting content, that’s what I need. Thank you for making this website, and I will be visiting again. Do you do newsletters by email? Hiya, I’m really glad I’ve found this info. Today bloggers publish just about gossip and net stuff and this is actually annoying. A good website with exciting content, this is what I need. Thanks for making this site, and I will be visiting again. Do you do newsletters by email? Hello there. I discovered your site by way of Google at the same time as looking for a similar topic, your web site got here up. It appears to be great. I’ve bookmarked it in my google bookmarks to come back then. Hey there. I discovered your web site by means of Google even as looking for a comparable matter, your site got here up. It seems to be great. I have bookmarked it in my google bookmarks to come back then. Very good information. Lucky me I came across your blog by accident (stumbleupon). I have saved as a favorite for later! Hello there. I found your web site by means of Google whilst looking for a comparable topic, your web site got here up. It seems to be great. I’ve bookmarked it in my google bookmarks to visit then. Hello there. I discovered your site by way of Google at the same time as looking for a related subject, your website came up. It looks great. I have bookmarked it in my google bookmarks to visit then. Hiya, I’m really glad I have found this information. Nowadays bloggers publish just about gossip and internet stuff and this is really frustrating. A good website with exciting content, that is what I need. Thanks for making this website, and I will be visiting again. Do you do newsletters by email? Hey there, You have done an excellent job. I’ll definitely digg it and personally suggest to my friends. I’m sure they’ll be benefited from this website. Hey there. I found your website by the use of Google even as searching for a related topic, your website got here up. It seems good. I have bookmarked it in my google bookmarks to visit then. Hiya, I’m really glad I have found this info. Today bloggers publish just about gossip and internet stuff and this is actually frustrating. A good web site with exciting content, this is what I need. Thanks for making this site, and I’ll be visiting again. Do you do newsletters by email? Hiya, I am really glad I’ve found this info. Nowadays bloggers publish only about gossip and net stuff and this is actually irritating. A good website with exciting content, that’s what I need. Thanks for making this website, and I’ll be visiting again. Do you do newsletters by email? Hello there. I discovered your web site via Google at the same time as looking for a comparable matter, your site got here up. It appears to be good. I have bookmarked it in my google bookmarks to come back then. Hiya, I am really glad I have found this info. Nowadays bloggers publish only about gossip and web stuff and this is actually irritating. A good web site with interesting content, that is what I need. Thanks for making this web-site, and I will be visiting again. Do you do newsletters by email? Hi there. I found your blog by way of Google whilst searching for a comparable topic, your website came up. It appears good. I have bookmarked it in my google bookmarks to come back then. After I initially left a comment I appear to have clicked the -Notify me when new comments are added- checkbox and from now on every time a comment is added I get four emails with the exact same comment. Is there a means you are able to remove me from that service? Appreciate it! Hello there. I discovered your site by the use of Google even as looking for a comparable matter, your web site got here up. It seems great. I’ve bookmarked it in my google bookmarks to visit then. Hiya, I’m really glad I have found this information. Nowadays bloggers publish only about gossip and net stuff and this is actually frustrating. A good website with exciting content, that’s what I need. Thanks for making this web-site, and I will be visiting again. Do you do newsletters by email? obviously like your web site however you need to test the spelling on several of your posts. Several of them are rife with spelling issues and I find it very bothersome to inform the reality however I¡¦ll certainly come again again. Hello.This article was extremely interesting, especially because I was looking for thoughts on this topic last Monday. Hiya, I’m really glad I have found this info. Today bloggers publish just about gossip and web stuff and this is really irritating. A good blog with interesting content, this is what I need. Thank you for making this site, and I will be visiting again. Do you do newsletters by email? Hi there. I found your website by way of Google even as searching for a similar topic, your web site got here up. It appears great. I have bookmarked it in my google bookmarks to come back then. Hey there. I found your blog by the use of Google whilst looking for a comparable topic, your site got here up. It appears to be great. I have bookmarked it in my google bookmarks to visit then. Hiya, I am really glad I have found this info. Today bloggers publish only about gossip and web stuff and this is actually irritating. A good site with interesting content, that’s what I need. Thank you for making this site, and I will be visiting again. Do you do newsletters by email? Hiya, I am really glad I’ve found this info. Today bloggers publish just about gossip and internet stuff and this is really irritating. A good website with exciting content, this is what I need. Thank you for making this site, and I’ll be visiting again. Do you do newsletters by email? Hiya, I am really glad I’ve found this info. Today bloggers publish only about gossip and internet stuff and this is actually irritating. A good site with exciting content, that’s what I need. Thanks for making this web site, and I’ll be visiting again. Do you do newsletters by email? Hey there. I found your site by way of Google at the same time as searching for a related subject, your site got here up. It appears great. I have bookmarked it in my google bookmarks to come back then. Howdy, There’s no doubt that your site may be having browser compatibility issues. When I take a look at your website in Safari, it looks fine however when opening in I.E., it’s got some overlapping issues. I just wanted to give you a quick heads up! Other than that, wonderful site! Hiya, I am really glad I’ve found this info. Today bloggers publish just about gossip and net stuff and this is actually annoying. A good site with exciting content, that’s what I need. Thanks for making this web-site, and I’ll be visiting again. Do you do newsletters by email? Hey there. I discovered your blog via Google at the same time as searching for a comparable subject, your website came up. It looks good. I’ve bookmarked it in my google bookmarks to visit then. Hmm it looks like your blog ate my first comment (it was extremely long) so I guess I’ll just sum it up what I submitted and say, I’m thoroughly enjoying your blog. I too am an aspiring blog blogger but I’m still new to the whole thing. Do you have any points for newbie blog writers? I’d certainly appreciate it. Hi there. I found your web site by the use of Google even as looking for a similar matter, your web site got here up. It seems great. I have bookmarked it in my google bookmarks to come back then. The next time I read a blog, I hope that it does not fail me just as much as this particular one. After all, Yes, it was my choice to read, however I really thought you would have something interesting to say. All I hear is a bunch of complaining about something that you could fix if you were not too busy seeking attention. Hey there. I found your website by the use of Google even as searching for a similar topic, your web site came up. It appears to be great. I have bookmarked it in my google bookmarks to visit then. Hiya, I am really glad I have found this info. Today bloggers publish only about gossip and net stuff and this is actually annoying. A good site with exciting content, this is what I need. Thanks for making this website, and I will be visiting again. Do you do newsletters by email? Hiya, I’m really glad I’ve found this information. Today bloggers publish just about gossip and internet stuff and this is actually irritating. A good site with interesting content, this is what I need. Thank you for making this web site, and I’ll be visiting again. Do you do newsletters by email? Hello there. I found your site by way of Google even as looking for a comparable matter, your web site got here up. It seems great. I have bookmarked it in my google bookmarks to come back then. Hiya, I’m really glad I have found this information. Nowadays bloggers publish just about gossip and net stuff and this is really frustrating. A good website with exciting content, that is what I need. Thank you for making this web-site, and I will be visiting again. Do you do newsletters by email? Hello there. I discovered your blog by the use of Google while searching for a comparable matter, your site got here up. It appears good. I have bookmarked it in my google bookmarks to visit then. Hiya, I am really glad I have found this information. Today bloggers publish only about gossip and internet stuff and this is actually frustrating. A good blog with interesting content, that’s what I need. Thank you for making this website, and I’ll be visiting again. Do you do newsletters by email? Hi there. I discovered your site by way of Google at the same time as looking for a comparable subject, your web site came up. It seems good. I have bookmarked it in my google bookmarks to come back then. Hiya, I am really glad I’ve found this information. Today bloggers publish only about gossip and net stuff and this is really irritating. A good blog with interesting content, that is what I need. Thanks for making this web-site, and I’ll be visiting again. Do you do newsletters by email? Hiya, I am really glad I have found this info. Nowadays bloggers publish only about gossip and web stuff and this is really frustrating. A good blog with interesting content, this is what I need. Thank you for making this site, and I’ll be visiting again. Do you do newsletters by email? Hiya, I’m really glad I’ve found this information. Today bloggers publish only about gossip and web stuff and this is really irritating. A good website with exciting content, that is what I need. Thanks for making this web site, and I’ll be visiting again. Do you do newsletters by email? Hiya, I am really glad I have found this information. Today bloggers publish just about gossip and net stuff and this is actually irritating. A good web site with exciting content, that’s what I need. Thank you for making this site, and I will be visiting again. Do you do newsletters by email? Hello there. I found your blog by means of Google at the same time as looking for a comparable topic, your site came up. It appears to be good. I’ve bookmarked it in my google bookmarks to visit then. Hiya, I’m really glad I have found this info. Nowadays bloggers publish only about gossip and internet stuff and this is really annoying. A good web site with interesting content, that is what I need. Thanks for making this web-site, and I’ll be visiting again. Do you do newsletters by email? Hiya, I’m really glad I have found this info. Today bloggers publish only about gossip and net stuff and this is actually annoying. A good site with exciting content, that is what I need. Thank you for making this site, and I will be visiting again. Do you do newsletters by email? Hey there. I discovered your site by means of Google even as looking for a similar topic, your web site came up. It appears to be good. I’ve bookmarked it in my google bookmarks to visit then. Can I simply say what a relief to discover a person that truly understands what they are talking about on the web. You certainly know how to bring a problem to light and make it important. More and more people have to read this and understand this side of the story. It’s surprising you aren’t more popular given that you definitely possess the gift. Hello there. I discovered your blog via Google even as searching for a comparable subject, your web site came up. It appears to be great. I have bookmarked it in my google bookmarks to come back then. Hi, i have a totally free wordpress blog. I have added the widgets that can be found in the widget area. But how do i add widgets that are from third parties such as clustrmaps? If totally free wordpress blog sites do not permit that, which cost-free blog solution permits that?. Hey there! This is my 1st comment here so I just wanted to give a quick shout out and tell you I genuinely enjoy reading through your posts. Can you suggest any other blogs/websites/forums that deal with the same subjects? Thank you so much! naturally like your website however you need to check the spelling on quite a few of your posts. Several of them are rife with spelling problems and I in finding it very troublesome to inform the reality on the other hand I will surely come again again. I am no longer positive the place you are getting your info, but good topic. I must spend some time finding out much more or figuring out more. Thank you for excellent information I used to be looking for this info for my mission. whoah this blog is magnificent i really like studying your articles. Stay up the good work! You already know, many people are hunting around for this info, you could help them greatly. Hey there. I found your web site by means of Google even as looking for a related matter, your website got here up. It looks good. I have bookmarked it in my google bookmarks to visit then. Hiya, I’m really glad I have found this info. Nowadays bloggers publish only about gossip and internet stuff and this is really irritating. A good website with exciting content, this is what I need. Thank you for making this web-site, and I’ll be visiting again. Do you do newsletters by email? Hi there. I discovered your website by the use of Google even as looking for a comparable topic, your website came up. It looks good. I have bookmarked it in my google bookmarks to come back then. Hey there. I discovered your web site by the use of Google while searching for a related topic, your site came up. It looks great. I have bookmarked it in my google bookmarks to come back then. Hello there. I found your website by the use of Google while looking for a related subject, your web site came up. It appears to be good. I’ve bookmarked it in my google bookmarks to visit then. Hiya, I’m really glad I’ve found this info. Nowadays bloggers publish just about gossip and web stuff and this is actually annoying. A good web site with exciting content, this is what I need. Thanks for making this site, and I will be visiting again. Do you do newsletters by email? Hiya, I’m really glad I’ve found this info. Today bloggers publish only about gossip and net stuff and this is actually frustrating. A good blog with interesting content, that’s what I need. Thanks for making this web site, and I will be visiting again. Do you do newsletters by email? How do you discover different blogs on Blogger with search phrase or search? Hey there. I discovered your site via Google whilst searching for a comparable subject, your website came up. It looks great. I have bookmarked it in my google bookmarks to come back then. Hiya, I’m really glad I have found this info. Today bloggers publish only about gossip and net stuff and this is actually annoying. A good web site with interesting content, this is what I need. Thank you for making this website, and I will be visiting again. Do you do newsletters by email? Hello there. I discovered your blog by means of Google whilst looking for a similar topic, your site came up. It appears good. I’ve bookmarked it in my google bookmarks to visit then. Hi there. I found your website by way of Google at the same time as looking for a related matter, your web site got here up. It seems great. I’ve bookmarked it in my google bookmarks to visit then. Hi there. I discovered your blog by means of Google at the same time as looking for a related topic, your website came up. It looks good. I’ve bookmarked it in my google bookmarks to visit then. Hiya, I am really glad I’ve found this info. Today bloggers publish only about gossip and web stuff and this is really irritating. A good blog with interesting content, that is what I need. Thank you for making this web-site, and I will be visiting again. Do you do newsletters by email? Hiya, I am really glad I have found this information. Today bloggers publish just about gossip and net stuff and this is really frustrating. A good web site with interesting content, this is what I need. Thank you for making this website, and I will be visiting again. Do you do newsletters by email? Hi there. I discovered your site via Google even as searching for a related matter, your website got here up. It looks good. I have bookmarked it in my google bookmarks to come back then. hi!,I love your writing very a lot! percentage we be in contact more about your article on AOL? I require an expert on this area to resolve my problem. May be that is you! Looking forward to look you. Hiya, I am really glad I’ve found this information. Nowadays bloggers publish just about gossip and net stuff and this is really frustrating. A good web site with interesting content, that is what I need. Thanks for making this web-site, and I will be visiting again. Do you do newsletters by email? Hi there. I found your site by the use of Google while searching for a comparable topic, your web site came up. It seems to be great. I’ve bookmarked it in my google bookmarks to come back then. Hey there. I found your site by means of Google at the same time as looking for a similar matter, your website got here up. It appears good. I’ve bookmarked it in my google bookmarks to visit then. Hiya, I am really glad I have found this information. Today bloggers publish just about gossip and net stuff and this is really irritating. A good website with interesting content, this is what I need. Thanks for making this site, and I’ll be visiting again. Do you do newsletters by email? Excellent goods from you, man. I’ve understand your stuff previous to and you are just extremely wonderful. I really like what you’ve acquired here, certainly like what you are saying and the way in which you say it. You make it enjoyable and you still take care of to keep it smart. I can’t wait to read far more from you. This is actually a tremendous site. Hello there. I discovered your web site by the use of Google at the same time as looking for a comparable topic, your site came up. It appears to be good. I have bookmarked it in my google bookmarks to visit then. Hello there. I found your web site by way of Google while searching for a related topic, your website got here up. It looks good. I’ve bookmarked it in my google bookmarks to come back then. Hi there. I discovered your website by way of Google at the same time as searching for a comparable topic, your web site came up. It appears to be good. I’ve bookmarked it in my google bookmarks to visit then. Hey there. I found your web site by way of Google while searching for a comparable subject, your website came up. It looks great. I have bookmarked it in my google bookmarks to visit then. Hiya, I am really glad I’ve found this information. Today bloggers publish only about gossip and internet stuff and this is really frustrating. A good site with interesting content, this is what I need. Thanks for making this web-site, and I will be visiting again. Do you do newsletters by email? Hello there. I found your website by way of Google whilst looking for a comparable matter, your web site got here up. It seems good. I’ve bookmarked it in my google bookmarks to visit then. Hello there. I found your site by means of Google at the same time as looking for a related topic, your web site got here up. It appears to be good. I have bookmarked it in my google bookmarks to come back then. Hi there. I found your blog by means of Google while looking for a related subject, your website got here up. It looks good. I’ve bookmarked it in my google bookmarks to come back then. Hiya, I’m really glad I’ve found this info. Today bloggers publish just about gossip and net stuff and this is actually annoying. A good site with exciting content, that’s what I need. Thanks for making this web-site, and I’ll be visiting again. Do you do newsletters by email?